While we are taking the summer off of our regular school year class schedule, we do offer some fun dance classes to help your child stay busy, keep moving, and have fun with other kids during their summer break. It’s so important to keep your child occupied during the summer with activities that will enrich their whole lives. Sure, it’s great to burn off energy, but we think that dance camp also offers them an introduction to dancing and we think that this adds to their life in many ways. Call our dance studio in Castlerock today to learn more about our summer dance camps. For children between three and seven, we offer Disney or Pixar-themed dance classes. These dance-themed classes include craft times, games, and more! We have two themes to choose from, including Disney Princess and Pixar Animation. If your child is a fan of either of these themes, they are sure to have fun! Imagine your little girl getting to learn a dance to celebrate her favorite Disney Princess. We are betting it will keep her dancing even when she gets home. If your son or daughter loves the Cars movie, the Pixar camp could be just the thing for them. Have your child burn off energy, have fun, and make friends at one of our summer session dance camps. Camps are held from 9:00 to 11:00 through the week. Call us for more information. If you child is interested in signing up for fall classes at Castle Rock Dance Academy, it is not too early to sign up. 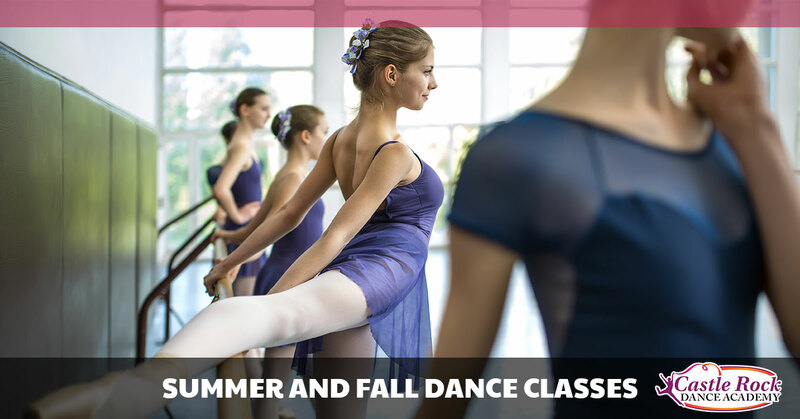 Talk to your child’s teacher if you are unsure of the next dance class for your dancer. The 13th of August is the last date to register for the school year of classes. We have two chances for your child to perform on stage. We will be doing the Nutcracker at Christmas time, as well as our dance studio’s annual end-of-the-year recital. We believe in the power of dance. We know from experience that dance can transform young people. We’ve seen it happen, year after year since we opened our dance studio nine years ago. Awkward girls have been transformed in self-possessing, graceful young women. There are many aspects of dance that go into this transformation. Dance involves physical exertion. It is aerobic and involves endurance, flexibility, and of course, agility. Self-discipline and self-confidence grow when a child takes dance lessons. A child will learn to keep their dance bag organized and all their equipment together. This won’t happen all at once, and there are sure to be panics over a lost shoe or tights along the way, but that is just part of the journey. Grace and composure are qualities all dances share. Repeatedly practicing smooth dance movements will translate to grace in other activities and everyday life. We think that exposure to the arts is a great benefit of dance. Additionally, tapping in to creativity is a great thing for every person. Personal expression through dance is an inherently human thing, and the benefits keep coming years after dance class is done. Call us today or use our online registration to sign up your child for dance class today.